Hi! I’m your friendly neighborhood biomechanist, the Fitness Pollenator, and I’m here to impart some quick lessons on how to take care of your spine. Enjoy! Just about everybody knows that picking things up off the floor with a round back is dangerous, but did you know that an overly arched back can be just as bad? 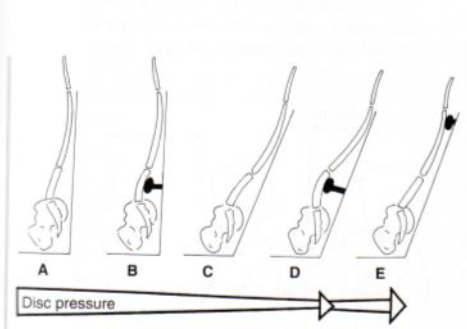 (2) a shear force that pulls the vertebrae apart transversely, which the spine doesn’t like nearly as much. In the image above, you can see that the size of the resultant force due to gravity is the same for both the neutral spine and the arched spine. However, that nasty shear component is clearly larger for the arched spine than the neutral one. 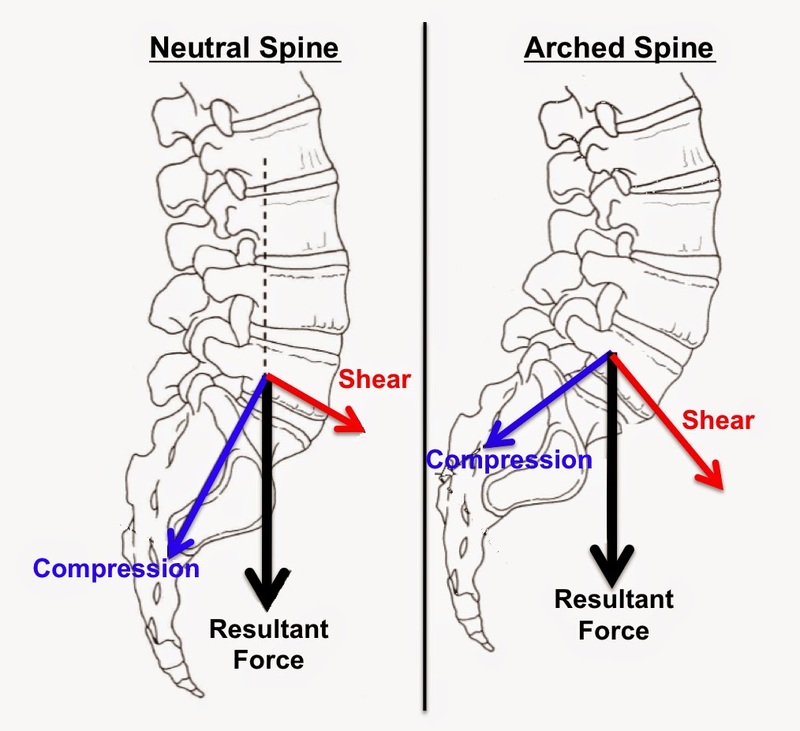 Maintaining a neutral spine position (by tightening the abs and glutes) during both bending and overhead movements means that more of the force gets transmitted through compression as opposed to shear, keeping you safer and pain-free. 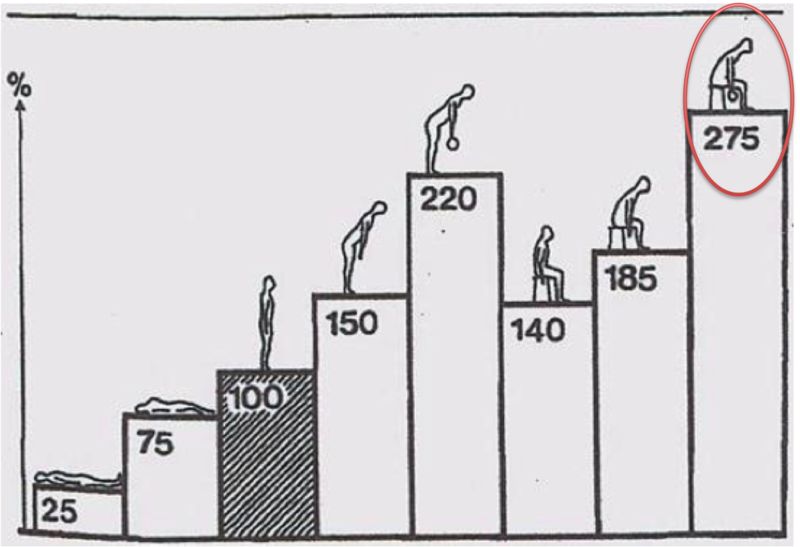 Do you ever pick up dumbbells from the floor like the poor guy on the far right in the graphic above? Don’t! Disc pressure in this position can be as much as 2.75 times that of standing. Instead, take the time to stand up and properly deadlift the weights to your sides, then sit back down and hoist away. Over the last few years, spinal flexion (sit-ups and crunches) has become a polarizing topic. Some experts demonize it, saying too much of it can eventually lead to disc degeneration. Anecdotally, though, there are folks who crunch away a thousand times per day pain-free! My take? Just like any exercise, flexion should simply be performed in moderation (i.e. 3 sets of 12 reps, once a week). Low rep, slow tempo crunches atop a physioball, where most of the movement comes from the thoracic spine (upper back), certainly won't kill you -- and may even provide some salubrious effects in terms of "body armor" and increased nutrient flow to the discs. But sometimes work requires long, uninterrupted periods of sitting. Usually by the end of these marathon sittings we find ourselves contorted into all sorts of neck-crooking, back-breaking positions. Sure, everyone knows slouching is no good and will leave you a hunchback over time. 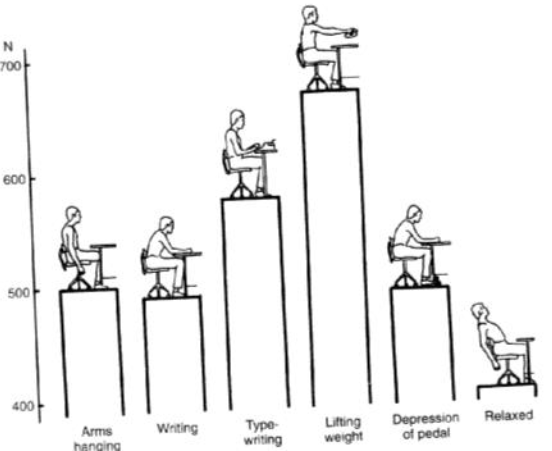 But it turns out sitting up rigidly straight like Grandma taught you can be just as bad due to high compressive forces in the spine. 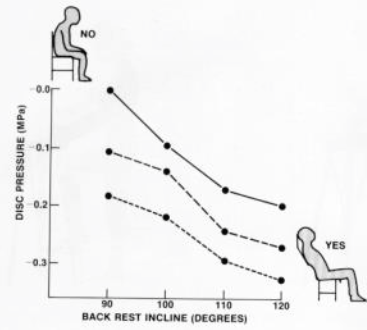 The best sitting posture in terms of disc pressure is actually reclined 20-30 degrees from vertical. In addition to this slight recline, a “lumbar roll” (towel placed in the small of your back) will further decrease disc pressure (see 'D' in the picture above). Add crossed legs to the equation to take the heat off your obliques and sacroiliac joints, and you’ve got yourself a solid, sustainable position. If you type all day, be sure to have your elbows supported, or at least place your keyboard close to your lap. There's nothing worse for your spine than having to support the weight of your arms all day. Also remember to relax back every once in a while to give your back (and brain) a break! Just be careful — sit too far back, and you run the risk of looking unprofessional and/or drifting off to sleep!